The Solar Power industry is served by the Solar Trade Association, and this month STM are in one of the trade magazines – Solar Business Focus – showing the Humus AFLR. 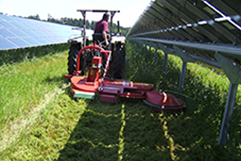 This unit is tractor-mounted [front or rear] and is designed to cut a fixed width plus it has an additional swing-out rotary head that is ideal for cutting under solar panels to avoid the frame uprights. With the additional sensor, the unit will detect obstacles automatically and the head swings away to avoid them. 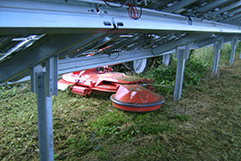 There are three widths in the range: 1.40 – 1.76 / 1.83 – 2.39 / 1.93 – 2.56, with power requirements of 20HP, 35HP and 40HP accordingly. And we had an enquiry within the first week of publication! SCAG and STM earn their stripes!